Instant "single-click" downloads at fastest speeds. 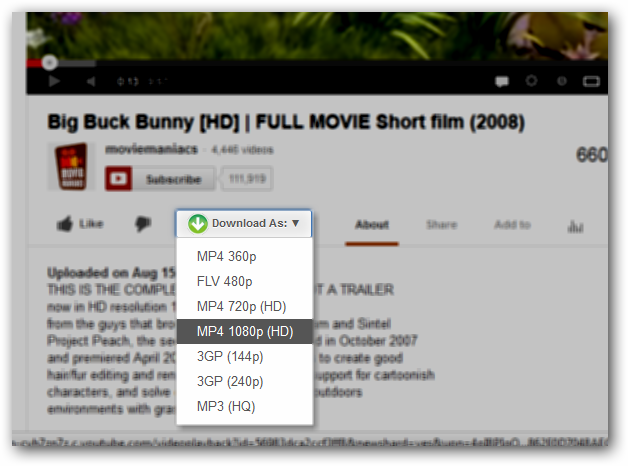 Download Youtube videos in 1920 x 1080 Full-HD MP4, FLV, 3GP and MP3 High-quality (256kbps) formats. 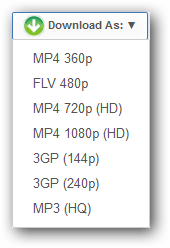 Downloading Youtube videos is dead simple now, no fiddling with external software's and copy pasting URL's. This cross-platform, cross-browser web-browser addon lets you download videos right from the Youtube page while you surf and enjoy. Direct video download links from Youtube servers for maximum speeds coupled with instant high-quality (192kbps) MP3 audio downloads at blaxing fast speeds without leaving the Youtube website. Unlike others the download button is elegant and non-intrusive. Shows only what's needed, and does not clutter the interface with unwanted details, unnecessary options and configurations. Usage of this website and all provided products is subject to compliance of your country's legal permissions, if your local laws do not permit downloads and audio conversions of online videos you are not allowed to use this service. You are also not permitted to use this utility to infringe any sort of copyright by downloading multimedia content which you don't have rights to use or is not open-source.